Throughout the year of 2017 Tajikistan has actively engaged with UNESCO to work on achieving Sustainable Development Goal 4 (SDG4) by 2030. Tajikistan's education policy-makers and other government officials have used every opportunity offered to strengthen cooperation with UNESCO and various international partners. That is why Tajikistan became one of the 40 countries, which openly presented their Voluntary National Review at the High-level Political Forum on Sustainable Development to support the united effort to "eradicate poverty and promote prosperity in a changing world. UNESCO Almaty Office worked with other UN agencies in Tajikistan to bring about Tajikistan's story of developing and implementing education strategy that pursues the fulfillment of SDG4 - Education 2030 programme. The profound effort of Tajikistan to openly share their experience and aspiration with regards to Sustainable Development Goal 4 agenda had sent a positive message to other developing countries. It is essential for all states to move forward and successfully reach the global target by 2030. In February 2017 Tajikistan was one of the countries that participated in the Subregional meeting on SDG4 in order to set out the objectives of the National education development strategy 2020 and long-term strategy for 2030. Since then Tajikistan has been participating in a greater policy dialogue of the issues and objectives of sustainable development on a global level. 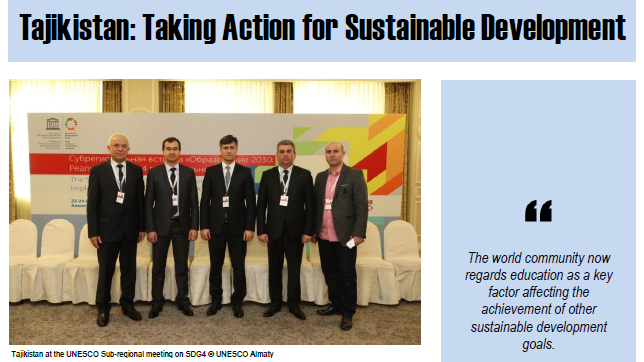 As a result, UN Department of Public Information has published a story on how Tajikistan takes action in education to achieve the Sustainable Development Goal 4. Read the story of success in education of the Republic of Tajikistan (English).